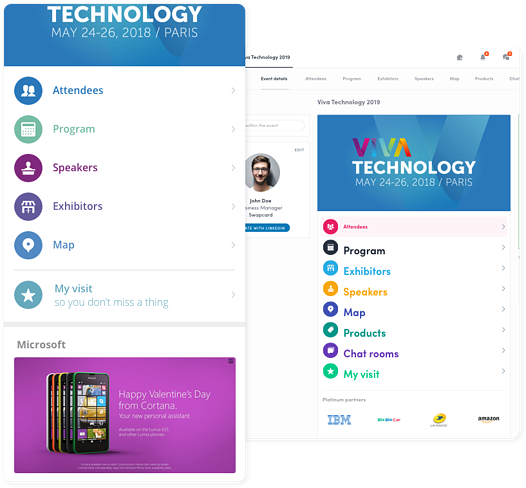 If you’ve used event apps before, you already know how they simplify networking, keep event details organized and deliver the best experience for your participants. But your event app should do more than all that — it should also help grow your digital event strategy and serve as a source of income. With the Swapcard event app, earn extra profit by leveraging networking features and digital visibility. Once you know the possibilities, you can add them to packages for your exhibitors and sponsors to purchase with their booths. 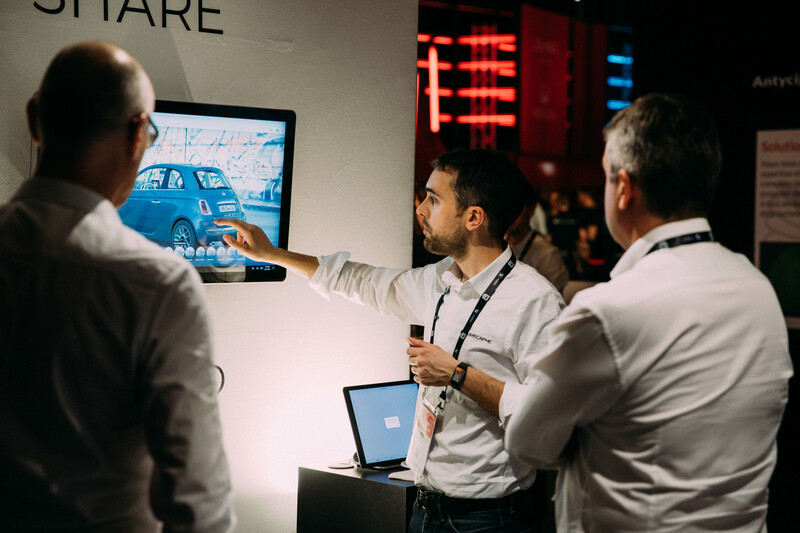 👉 Badge scanning: provide your exhibitors with a tool to capture qualified leads. 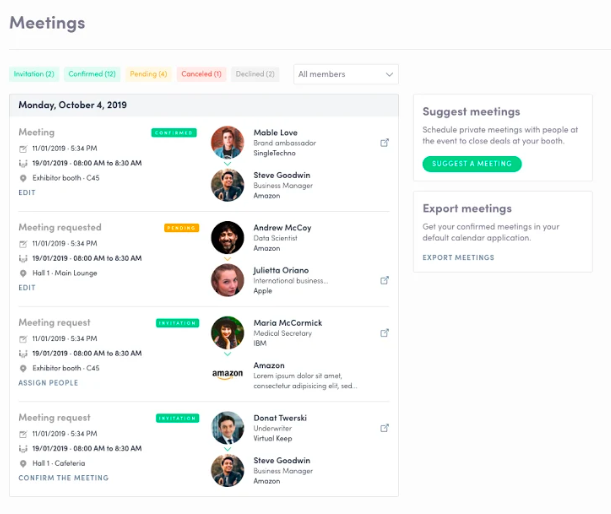 👉 Matchmaking platform: give them a way to book meetings with quality prospects. 👉 Digital visibility: offer packages that place a company and its innovations front and centre. 👉 Push notifications: let them connect with their audience using targeted alerts. Ready to learn how you can generate revenue from your event app? Let’s dive in! When you think of a badge scanner, you might picture those tools that look like something you see cashiers use at the grocery store. The issue with these physical scanners is that they don’t give exhibitors control of their data. The gathered information often isn't available until a few days after the event ends. And, it’s messy. Since exhibitors didn’t have the chance to add notes and tags to the contacts they met, the data is hard for them to organize. The follow up is generic and difficult to manage. Swapcard resolves this with a badge scanner (which can also scan business cards) built into our event app. Having a scanner in the app allows exhibitors to capture the contact details of their leads quickly, add notes and tags, facilitate and personalize follow-ups and calculate their ROI. Exhibitors want to spend their time at your event in a meaningful way. They come to network and meet people who will help them innovate. If you can provide them with efficient technology that lets this happen, they’ll want it in their package. We've mentioned why separate scanning tools aren't a practical solution; we can say the same about physical business cards. With business cards, it's challenging to keep track of contacts and organize the information. An in-app badge scanner lets exhibitors capture contacts and then saves them to the app. After the show, they can share them with their team members, export them to an Excel file and import them to their CRM for follow-up. Offering your exhibitors a tangible way to measure their ROI also means they’ll be more likely to rebook for next year. We saw this idea applied at Laval Virtual, an exhibition and conference on augmented and virtual reality and immersive techniques. 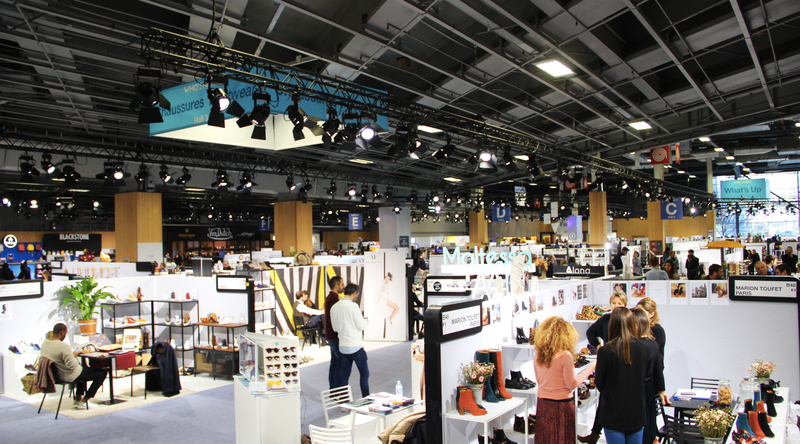 When companies purchased their booth at Laval Virtual, they were offered an exhibitor package. The package included inbound and outbound badge and business card scanning, meaning they could scan their prospects and attendees could capture their information, too. They had a dedicated dashboard (pictured below), which displayed information on all scans made and received by team members, plus any notes or tags that were added to give context to the interaction. After the event, they could review these stats and calculate their ROI. They could also export these contacts to an Excel file and import them to their CRM for follow up. Exhibitors were able to capture qualified leads at the event, keep them organized and effectively calculate their event ROI. The data collected from connections made via the scanning tool at Laval Virtual let organizers measure their exhibitors' success. They also generated extra income from selling the tool in a package along with the booth, and in return, gave the exhibitor added value. What is a matchmaking platform? A matchmaking platform makes it easy for exhibitors to schedule appointments with qualified prospects. It empowers them to prepare their meetings before the event begins and reduce their sales efforts on site. With access to a targeted selection of attendees, exhibitors can schedule meetings with the most relevant ones and improve their return on investment. Matchmaking saves exhibitors from spending time on interactions with people who aren't suited for their product, service or innovations. They won't have to scramble for meetings and are guaranteed their time spent at your event will be valuable. You can include the matchmaking platform as part of an exhibitor package, with the option to separate inbound and outbound requests. 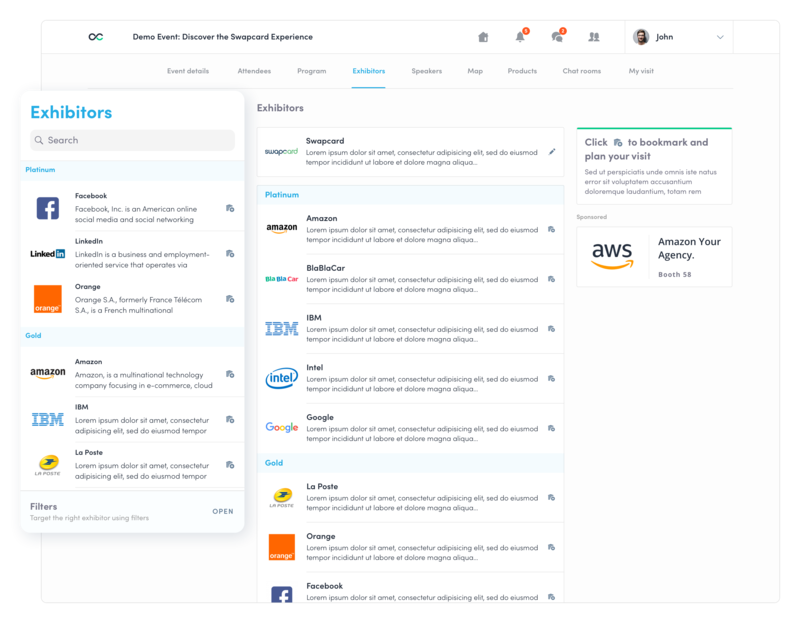 With inbound matchmaking, exhibitors list their team members and available meeting times on their company page. Before and during the event, attendees can send members a meeting request. Team members receive a push notification and email alerting them of the request, which they can choose to accept or decline. On their exhibitor dashboard, they can edit their availability, view their meeting requests and assign them to the appropriate sales representative. After the event, they can export the meeting details to an Excel file. Outbound matchmaking lets companies target their prospects by giving them access to the list of registered attendees before, during and after the event. They can search for prospects via the search bar or using tags, filters and sub-filters. Artificial intelligence suggests the most relevant attendees for them to meet according to their profile, search criteria and behaviour in the app (pictured below). Companies can target and pre-qualify the attendees they wish to meet ahead of time and request to have an appointment with them at the event. Outbound matchmaking gives companies an edge over other companies who don't buy-in to this feature. A matchmaking platform gives your exhibitors control over their event schedule. 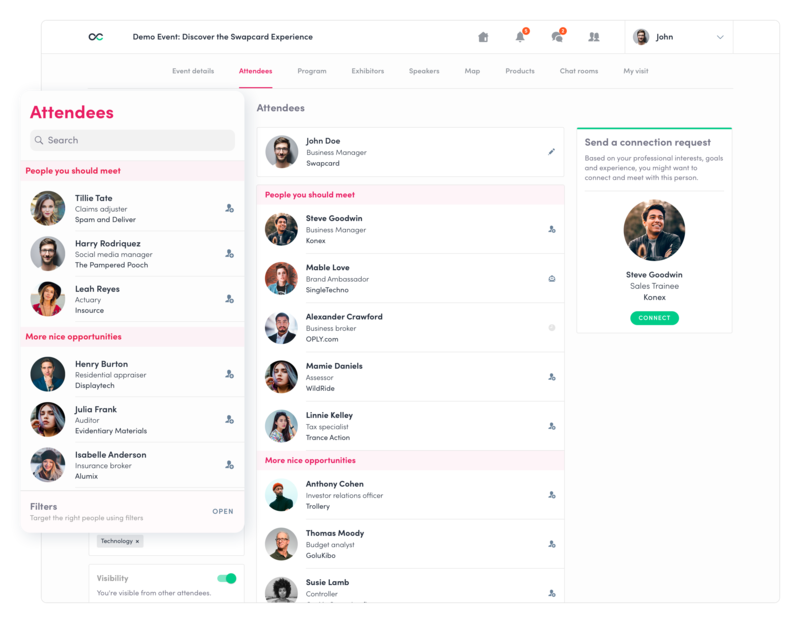 It lets them book meetings with quality prospects, saves them time by allowing them to prepare in advance and ensures they'll increase their event ROI. As an organizer, you make this happen by offering them a matchmaking solution in their exhibitor package. You can review which exhibitors booked the most meetings and measure the success of your event using detailed stats. According to a study from the Center for Exhibition Industry Research, 92% of attendees come to trade shows to learn about new products and company innovations. Visitors are here to meet exhibitors, so let’s get them noticed! Digital visibility refers to where and how much your exhibitors and sponsors appear in digital communications, such as in the app and emails. We can no longer leave it up to chance that an exhibitor's ideal prospect will happen to come to their booth. There are too many companies vying for the attention of attendees, and time is limited. The greater a company's visibility in digital spaces, the better their chances of getting in-person meetings. There are several areas where a company's digital visibility can get a boost, which we’ll look at in more detail below. At Swapcard, we’ve observed that, on average, companies with a banner on the event homepage are three times more likely to be bookmarked and receive 1.5 times more appointments (compared to companies who don’t have a banner). You can also display logos on the event app homepage below the banner. Our statistics show that attendees are twice as likely to bookmark companies with a logo. As a result, they receive more meetings versus companies who don't have a logo on the homepage. 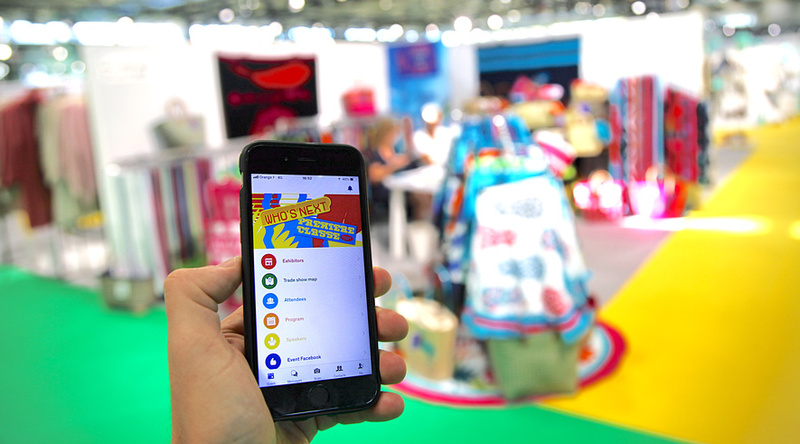 When an attendee clicks on a banner or logo, they can be redirected to the company page within the app, which includes more information such as a bio, contact name, booth number and any other relevant info. Another opportunity for logo placement is in onboarding emails sent to attendees. As these emails are sent to all registrants, they’re seen by a large number of visitors. Swapcard lets you integrate a digital map into your event app. During an event, the interactive map is one of the most used features, meaning it gets a lot of screen time with your attendees. You can sell your exhibitors and sponsors the option to add their logo and point out their booth location on the map so that attendees know where to find them. When they click on the logo, they are redirected to the company page. If you’ve opted for a branded app with Swapcard, you can make a splash screen available to one company. This fills the screen with one brand upon opening the app before it lands on the event app homepage. The company is placed front and centre for a recommended four to six seconds. The Swapcard event app has a dedicated exhibitor area that lists the companies attending your show. You can organize them by different ranks to give more visibility to certain companies. We’ve seen that companies who opt for top-level sponsorship packages (as seen in the above example as "Platinum" and "Gold") are viewed more often since they appear first on the exhibitor list. As a result, they receive a higher number of visitors and meetings. The statistics we've collected over events show us that companies with increased digital visibility receive more clicks and views on their company page, and as a result, book more meetings. Push notifications reach attendees in real time, with pre-scheduled or on-the-fly messages. The alerts appear on the mobile phone of any attendee who has downloaded the event app, regardless if they are active in the application. These messages can promote the company's latest product and services, highlight an upcoming presentation, announce a demo and more. Using targeted and customized messaging, companies can segment their audience with different notifications to ensure that the right message gets across to the right people. Push notifications ensure that visitors don't miss out on any important information. Push notifications should be a semi-exclusive offer, limited to a certain number of companies. You can either sell this as part of a digital visibility package or add the option to other available packages. Push notifications let companies convey essential and time-sensitive messages to visitors. Attendees stay informed and receive the messages directly to their mobile phone. When attendees click on the notification, they are redirected to the company page where they can review more details. After the show, Swapcard can show you how many visitors have clicked on the notifications so you can present your exhibitors with the value and results. Use concrete data to measure success. 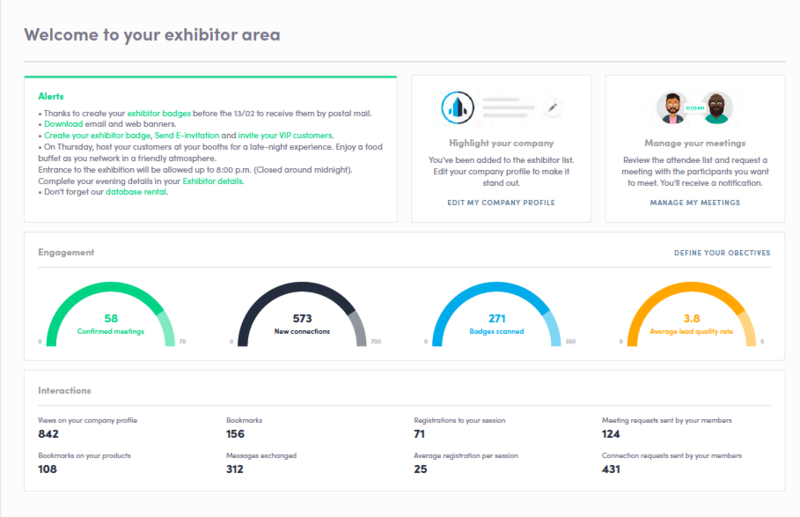 For example, show the number of times an attendee clicked on a company logo or the engagement rate between attendees and exhibitors who paid for extra features versus those who didn’t. Instead of offering individual options, make the process less time-consuming by creating packages and selling a mix of square meters, digital networking and visibility services. Our Event Team works with your Sales Team to sell these benefits. We offer support on the creation of your packages, sales pitches, personalized designs and workshops. Contact us for a demo to learn more!